As close as you’ll get to the real deal. Immense. Impossible to capture the 'magic of the room'. At its premium price point, the follow-up/accompaniment to Swing! needs to impress. 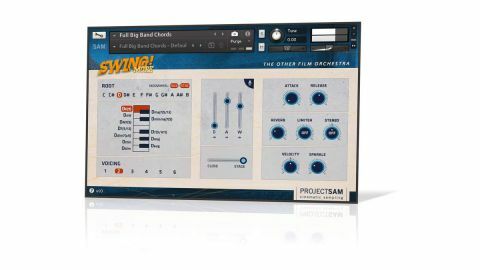 Fortunately, with its 120,000 samples (80GB, compressed down to 40GB) spanning a wide range of big band ensemble and solo instrumentation, played by a crack team of jazz veterans, this immense Kontakt Player library certainly does that. From brass of all kinds, drums, percussion, bass and guitars through to vocals, strings and more, you get plenty of articulations, phrases, strums, grooves, runs, etc. The Big Band Chords patches are particularly noteworthy, presenting 12 ensemble chords for each of the 12 root notes - instant jazz! Three mic positions and a handful of other controls offer a degree of sound shaping, but this is clearly a package in which the recorded sounds are the focus, rather than a profusion of processing options. Of course, it’s simply not possible to 100% faithfully ‘virtualise’ the attitude and dynamism of a real big band (the ‘everyone in the room together’ factor), but this is as close as it’s currently possible to get.